Planning on selling or buying a home anytime soon? Realtor commissions are something you should understand first. The current market rate of a realtor’s service is 6% of your home’s selling price. 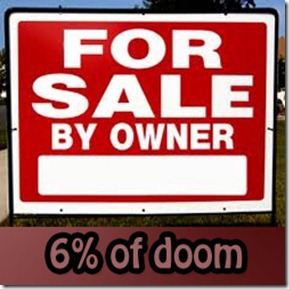 That means if you sell your house for $200,000 – the realtor commission is $12,000 of your money. This equates to the first 40 months of equity built on a 4.25% interest rate, 30 year mortgage! If you are a buyer you may be thinking “I don’t pay the realtor commission of 6%.. the seller does.” This is true, but you have committed yourself to paying those realtor commissions by purchasing the house, you have generated an unrealized expense. That $200,000 house sells 40 months later for $200,000 again, you are walking with nothing from your 40 months of living there (losing any money you put into the home). Sell your house on your own. Conclusion: If you think that you will have to offer a discount on your home and pay an attorney to close your home – the commission might be almost reasonable by comparison. Let’s say you have a $150,000 house which would be $9,000 in commission. To break even, you as a for sale by owner must get $141,500 as a sales price. Considering the time and hassle that be involved with “For Sale By Owner” you want to make sure you are not breaking even. Anything above $141,500 in this example is a gain – so it all comes down to how much more do you think your realtor can sell your house. Going off above, find a deeply discounted “For Sale by Owner” property. Make it clear to them you understand they are saving 6% and that you want the vast majority of that savings. Maybe the house can sell for $150k through a realtor – but you want it for $143k, if the seller is the person from above – they still will view this as a $1,500 gain over selling with a realtor.